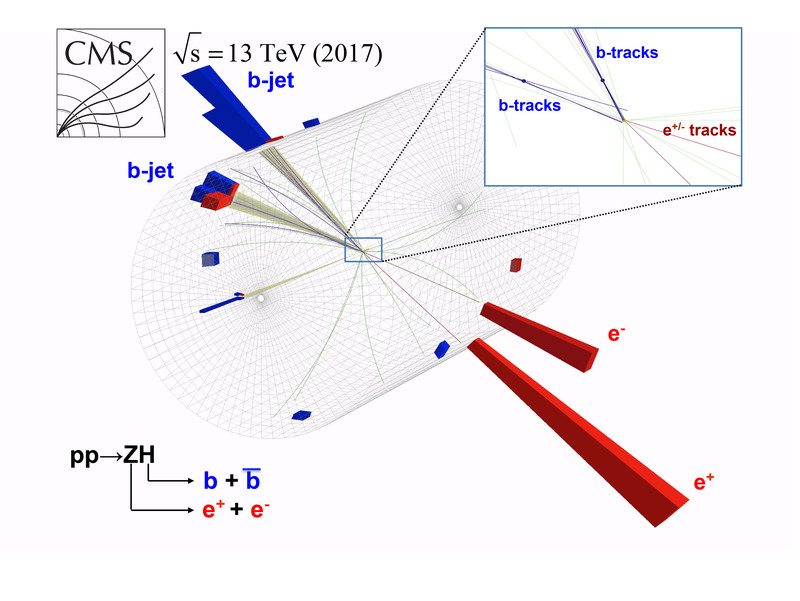 Last month, the ATLAS and CMS collaborations jointly announced the discovery of the Higgs boson decaying into a matter-antimatter pair of bottom quarks. Previously, the Higgs boson has been observed decaying to photons, tau-leptons, and W and Z bosons. However, these impressive achievements represent only 30 percent of Higgs boson decays. The most common way for Higgs to decay remained elusive for almost 6 years since its discovery in 2012. Though the Higgs to b decays is one of the domintant channel it took longer to see it. The reason is the difficulty of discerning this signal from a rich and complicated background and the presence of pairs of bottom quarks not originating from the Higgs boson. Researchers had to deploy modern sophisticated tools and focus on H→ bb decays in association with another particle – in this case a Z or W boson. This technique proved to be fantastically successful After several years of refining their techniques and gradually incorporating more data, both experiments finally saw evidence of the Higgs decaying to bottom quarks that exceeds the 5-sigma threshold of statistical significance. Distributions of signal, background, and data event yields sorted into bins of similar signal-to-background ratio, as given by the result of the fit to their corresponding multivariate discriminant. All events in the VH, H → bb signal regions of the combined Run 1 and Run 2 data sets are included. The bottom panel shows the ratio of the data to the background, with the total uncertainty in the background yield indicated by the grey hatching. The red line indicates the sum of signal plus background contribution divided by the background yield. It is crucial to understand the rate at which Higgs bosons decay into other particles and compare it with the predicted decay rates. The easiest way to illustrate agreement is to report the observed rate of decay, divided by the predicted rate. Better agreement between the two will yield a ratio close to 1. 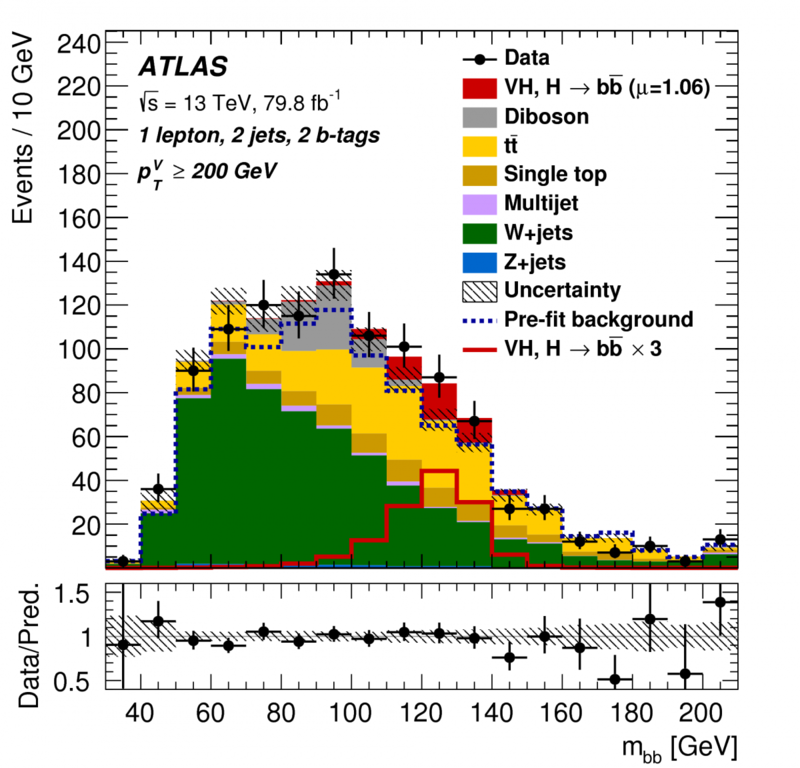 The CMS experiment finds excellent agreement in today’s announcement, with a ratio of predicted-to-observed rates of 1.04 plus or minus 0.20, and the ATLAS measurement is similar (1.01 plus or minus 0.20). This impressive agreement is a triumph of current theory, although it does not indicate a direction toward a more fundamental origin for the Higgs phenomena. With the observation of Higgs to bottom quarks ATLAS and CMS have observed all main production modes of the Higgs boson. So far, these have been in excellent agreement with Standard Model predictions over a range covering three orders of magnitude in mass, from the top quark (the heaviest particle in the Standard Model and thus with the strongest interaction with the Higgs boson) to the much lighter muons (for which only an upper limit of the coupling with the Higgs boson has been obtained so far). The new results opens a new era of detailed measurements in the Higgs sector opens up, through which the Standard Model will be further challenged.This current measurement is consistent with the SM expectation, however, its precision still leaves room for contributions from new physics. In the coming years, much more data will be collected and the precision will be improved in our quest to answer the open questions in modern physics. Observation of Higgs boson decay to bottom quarks (CMS collaboration). (arXiv: 1808.08242, published in Physical Review Letter).